San Diego Gallery Charged With Trafficking Over $1.3 Million Worth Of Ivory Items During a sting operation, officials successfully bought one item banned from purchase under state law and were offered three more, leading to a search warrant and the large bust. City Attorney Mara Elliott at the San Diego Zoo, where she announced ivory trafficking charges against a local gallery. She is surrounded by officers from the state Department of Fish and Wildlife. Criminal charges have been filed against a San Diego art gallery after officers confiscated $1.3 million worth of items containing ivory, which is banned from sale. The seizure of collectibles made with elephant tusks and hippo teeth at the Carlton Gallery in La Jolla is the largest since California instituted the ban in 2016, according to the San Diego city attorney's office. "Ivory trafficking is an illegal and reprehensible business that encourages the senseless slaughter of elephants and other endangered species," City Attorney Mara Elliott said. 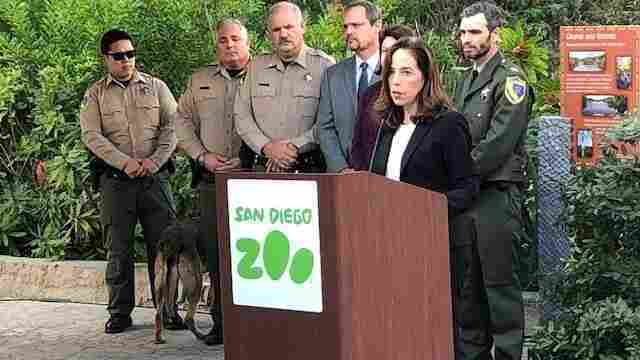 "I hope this prosecution sends a strong message to anyone who sells or is thinking about selling ivory on the black market in San Diego: We will find you and prosecute you to the fullest extent of the law." The gallery, owner Victor Cohen and salesman Sheldon Kupersmith have been charged with multiple misdemeanors. They could carry a sentence of up to a year in jail and fines up to $40,000. The gallery declined to comment on the allegations. The ban, known as AB 96, is enforced by the California Department of Fish and Wildlife, which began investigating the gallery more than a year ago. In May 2017, officers from the trafficking unit saw two sculptures in the gallery's windows that appeared to contain ivory. They returned twice and saw more. Then in May 2018 undercover officers purchased an ivory sculpture from Kupersmith, who offered to sell them three more. The officers got a search warrant and confiscated 146 items from the gallery later that day. Cohen, the owner, then led investigators to a nearby warehouse, where 192 items were seized. Most of the ivory in the confiscated items came from elephants, although some items contained ivory from hippopotamus teeth. Regardless of what animal the ivory comes from, the California ban explicitly prohibits the "purchasing, selling, offering for sale, possessing with intent to sell, or importing with intent to sell ivory or rhinoceros horn." The ban exempts musical instruments made before 1976 that contain less than 20 percent ivory and antiques at least 100 years old and less than 5 percent ivory. It also permits the purchase and sale of ivory made by scientific or educational institutions, as long as it was legally acquired before 1991. Of the more than 300 pieces confiscated from the Carlton Gallery, none fell under those exemptions. The World Wildlife Federation says that tens of thousands of elephants are killed every year because of the ivory trade.